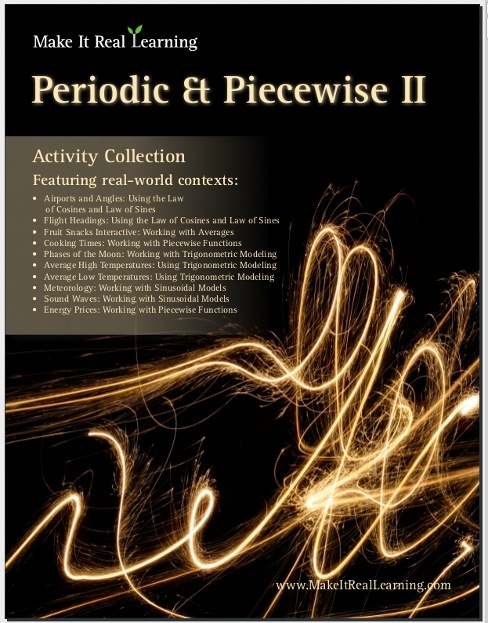 The Make It Real Learning Periodic and Piecewise II workbook focuses on real-world situations that may be effectively modeled mathematically with trigonometic and piecewise functions. book suits best high school algebra. From studying phases of the moon to analyzing energy prices using piecewise functions, learners get to use mathematical modeling in meaningful ways. Each activity integrates real world information, companies, and issues (e.g. sunrise and sunset times, residential energy rates), not just "realistic" data. The workbook includes 10 activities focused on helping learners master the Common Core State Standards for Mathematics (www.corestandards.org). Each workbook activity focuses on making sense of mathematics in a real-world context. Mastering mathematics means more than memorizing procedures. Learners need to discover how to think critically and use mathematics as a tool to better understand the world. There are multiple ways to use the activities of the book in a teaching environment. The activities are an excellent tool for stimulating mathematical discussions in a small group setting. Due to the challenging nature of each activity, group members are motivated to brainstorm problem solving strategies together. The interesting real world contexts motivate them to want to solve the problems. The activities may also be used for individual projects and class-wide discussions. As a ready-resource for teachers, the workbook also includes completely worked-out solutions for each activity. To make it easier for teachers to assess student work, the solutions are included on a duplicate copy of each activity. The PDF for this book is enabled for annotation. This means that if you prefer, your student can fill it in on the computer, using the typewriter and drawing tools in Acrobat Reader version 9 or greater. Working with Averages Determine mean, median and mode. Write a sinusoidal function that fits a given graph. Includes 11 Make It Real Learning activity workbooks for the price of 8! You get three workbooks for free! Inludes all 50 States by the Numbers workbooks at a whopping 87% discount! 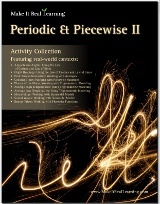 You will be purchasing the download from my authorized reseller Comecero, LLC. By purchasing any of the Make It Real Learning workbooks, permission IS granted for the teacher (or parent) to reproduce this material to be used with his/her students in a teaching situation; not for commercial resale. However, you are not permitted to share the material with another teacher.